In 1948, a small group of families in Los Angeles dreamed about founding a temple that would become a part of the sweeping movement to establish Reform Judaism in Southern California. It was a dream of a religious home, the simplicity and sincerity of which would reflect our faith. 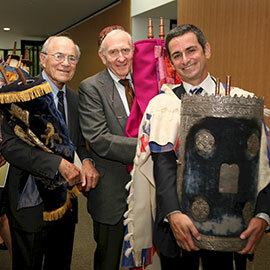 With the leadership and guidance of Rabbi Alfred Wolf, Temple Beth Aaron was formed. Soon after, members of this young congregation heard a legendary rabbi speak. This rabbi had survived the Holocaust and risked his life as one of the most important leaders of German Jewry in its struggle to survive under Nazism. He was a model of the human capacity to rise above the most degrading experiences. This rabbi’s name was Leo Baeck. So moved were they by his inspiration – our founders chose to rename the young congregation Leo Baeck Temple.